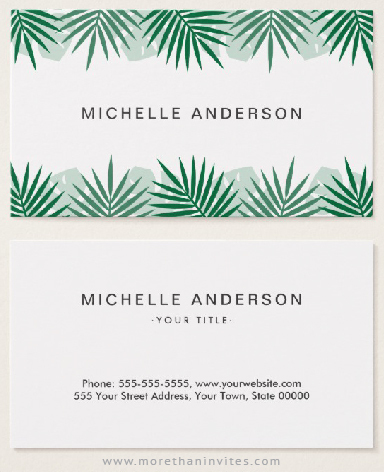 A modern, minimal business card with palm leaves and monstera leaves arranged as a green border top and bottom on the front. Your name is printed in dark gray in the middle. Customizable template fields for name, title and contact information on the back. This designer business card template is perfect for interior designers, beauty salons, decorators, resorts, bloggers, garden designers, gardeners, florists etc. Available from Zazzle.